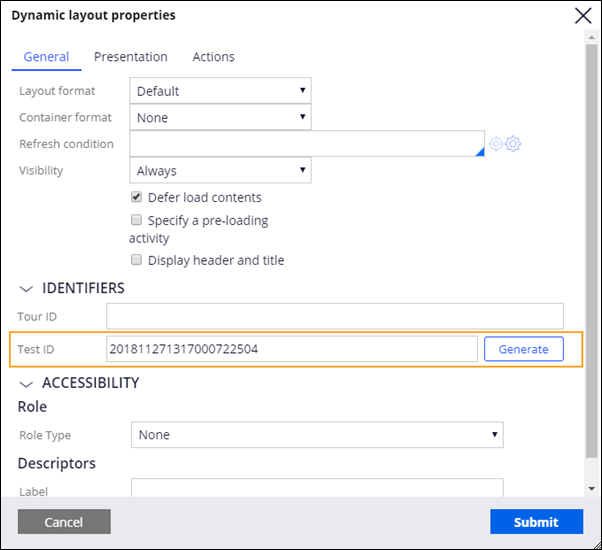 Test IDs allow Pega application developers to create a unique identifier for each user interface component. Test IDs are unique numerical strings that appear in the markup of an application. An automated test can use the test ID to identify a user interface element and run a test against it. Access to the test ID functionality is controlled by a role within an access group. Not all Pega Platform™ users require access to the test ID functionality. Only developers who create or run tests against the UI need access to the test ID functionality. Limiting access prevents accidental alteration of the test IDs. At run time, without the test IDs included in the code, the client downloads less code, improving performance. Access to test ID functionality is controlled by the PegaRULES:TestID role. By default, access groups do not include the PegaRULES:TestID role. You can grant access to the test ID functionality by adding this role to an access group. In Dev Studio, create a new access group or open an existing access group that you want to grant access to the test ID functionality by clicking Records > Security > Access group. Select the access group from the list. 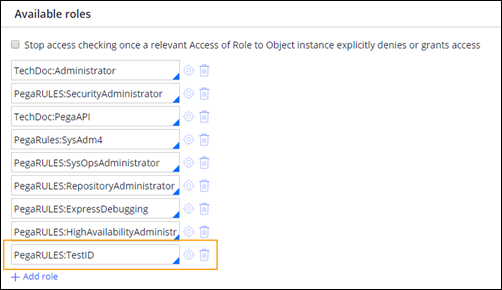 On the Definition tab in the Available roles section, click Add Role. In the blank text area added to the end of the Available roles list, enter PegaRULES:TestID. The Access group with the PegaRULES:TestID access role. Members of the access group now have access to the test ID functionality. To add a test ID to a user interface element, open the General tab of the properties panel in and click the Generate ID button. For more information on user interface elements that support the test ID functionality, see Test ID and Tour ID for unique identification of UI elements.